Here's what one reader has to say about the book. Click on the image to link to amazon to buy the book NOW! The Universe that we live in operates by specific parameters and universal laws. We live in a self-correcting system that is perfect in every way. A system where you can immediately feel the consequences of your thoughts, word sand actions. Here's what another reader has to say about the book. Throughout the ages and ever since mankind has existed, infinite universal laws have always existed and they continue to exist as long as there is life. We can look at these laws as keys that open the mysteries of life itself. 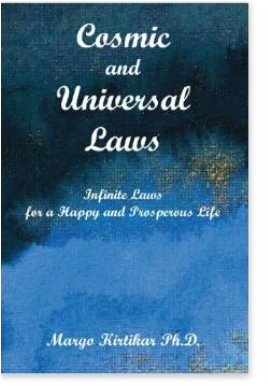 This book is a compilation of 269 Universal Laws and Principles within whose orbit our lives unfold. For Life to exist everything must be in the right proportions to everything else. If the Earth was closer to the sun, it would be impossible for life to exist, if it were too far it would be much too cold for life to exist. 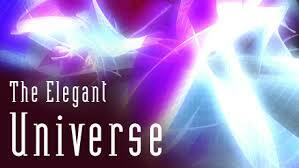 The universe is intelligent and is finely tuned with respect to the existence of all life. There is an intelligence at play here which we call God, a Supreme Intelligent Being. Our lives are governed by many intricate complex entangled universal laws. When we understand these laws and apply them consciously, we are able to create whatever we desire. We live on a perfect and intelligent planet. This is not an accident of nature, it is too precise, too finely tuned and too perfect to be a cosmic coincidence. Just a fraction of imbalance anywhere will have drastic consequences. This includes our own physical bodies and health. is only too eager and willing to please you and to grant your every wish? to tap into the ultimate Power of the Universe! Following my passion I coach guide and mentor people since 25 years. If you've been wondering why you still are wherever you are in spite of all your efforts to manifest all your desires then you haven't been told everything.... you haven't been given all the pieces of the puzzle. Let me help you understand how the universal laws work. Things are always simple when one knows how! We are living in a time where we, the human family, are taking the next step in evolution from Homo Sapiens to transform to Homo Luminous or Light Beings. This step will require a conscious shift in each and everyone of us. This book COSMIC AND UNIVERSAL LAWS serves as a perfect guide for you to make this shift with ease and understanding. 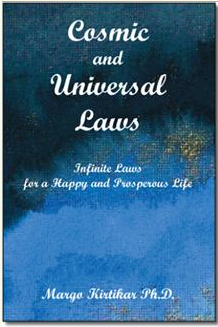 It lists no less than 269 infinite laws and explains how these laws and principles work and how they govern our lives. The laws and principles of life are numerous and they are intricate and paradox but they can be studied and followed by anyone who is really interested in making the effort and investing the time ad energy needed. When we become aware of these laws and integrate them into our daily lives, we will immediately notice the difference as we begin to manifest miracles in our lives. A few of these laws are known to us, some we are aware of in our subconscious but the majority remain untapped and unknown. The more humanity understands cosmic laws and lives by them and respects them, the nearer we will be to peace on earth and the golden age that is prophesied in the Vedas. The more you know about and live in harmony with these universal laws the easier the transition will be for you personally. mathematical, sensible and exists for a reasonmin perfect order and harmony. in unison with these infinite laws of nature you are generously rewarded by having all your wishes granted and even more as an extra bonus! The universe is generous in giving when we mind the laws of life! you are able to create your own reality when you allow the energies to respond to your needs to help you create what you desire. Much has been written about the laws of Attraction, Manifestation and Visualization, to create a dream life for yourself. However, these are only some parts of the whole story. There's a whole system involved that we need to understand. The jigsaw puzzle of life is more complex than just visualizing and wishing to manifest our dreams. It's both complex and easy. It's a paradox like everything else in life, without knowledge and the 'how to' instructions, it is difficult, sometimes impossible, to put anything together, but once you have the knowledge and you know how, it suddenly becomes easy, in fact, with regular practice when we learn to flow with the infinite universal laws, everything becomes very easy. These are modern terms for what the ancient Vedic Teachings of Wisdom called the Cosmic Etheric Field, the Ocean of Ether, the ocean of pure Energy, the Consciousness that surrounds and permeates all living beings, all life, and the whole cosmic universe. It is alive. It is electric. It is pure intelligence. We can communicate and inter-relate with this cosmic intelligence at will and it will respond to our needs when we communicate with total awareness, deep concentration and full intent. This ability is inherent in everyone of us and it can be learned. It's about total focus and full concentration! It requires training and effort but it can be learned. and it is consciousness alone that creates and directs all things. that we also can create miracles! connect with the Universal Mind, all knowledge is revealed to us! and all that is needed to use this power is knowledge. The Reality, the Truth is simple. it in search of more complex explanations! This knowledge has always been available! In the past, however, this secret knowledge was available only to the few. Today this knowledge is revealed to one and all alike. It is easily available for those who really want to know. accumulate all the health, wealth and abundance that you desire. so you can control your fate, your destiny and your luck. The most special substance that describes the true nature of reality is water. Yes reality is as fluid as water! to the energy level that you resonate at. you can bend and shape your reality at will. Imagine this, you are standing by a large pool of water and you throw in a stone which causes ripples in the water. The size and shape of the ripples you create in the water depends on the way you stand, the angle of your arm as you throw, the size of the stone and the concentration and the force with which you throw in the stone. You do exactly the same thing with the intelligent forces and ethers of the cosmos with your mental state of mind, with your thoughts and your intent, your conscious awareness level of concentration causes ripples in the magnetic etheric field around you which cannot help but respond to your intent. It is designed to do that as per cosmic and universal infinite laws. This force, this energy is neutral, it is we who give it quality, we color it with our intentions thoughts and desires. Whether our wishes are good or bad the energy field will react and give us what we ask for. The only problem is this, if we have bad intentions, the cosmic laws will make sure that we have a domino effect of the same bad energies coming back to us. This is according to another universal law. The very same goes for us when we have good intentions. We have the freedom of choice. Ask and it shall be given unto you. When you create in harmony with the Creator you are rewarded tenfold over. Throughout the ages the sages have claimed this. When you do good you are rewarded with the same goodness tenfold! However, the very same law also goes for when you do harm. Your problems and suffering will increase by tenfold. You get back whatever you dish out to others around you according to yet another of the universe. and how it governs the motion of all things in existence. in harmony with the Creator. but that is the wrong approach. in total harmony from within, all secrets will be revealed to you. In this book the intricacies and perplexities of life are revealed to you! Learn to live life with a state of consciousness that is extremely liberating and full of appreciation for every present moment.The Law of Consciousness. This is the Magical Way of Living and Being. The Law of Magic and the Law of Being. You must reconnect to this state of consciousness to live life with complete freedom and to manifest your desires effortlessly. The Law of Life, The Law of Freedom, the Law of Consciousness, the Law of Desire and the Law of Effort. Two ways exist to use the Power of the Universe, one is from the place of FEAR and the other is from the place of LOVE. Both can be used with equal success to create your reality but with very different results! Here is the clue for the true cause of all Failure. To be in control of causes and effects is a part of creating your Reality and Conscious Creation requires total Awareness and Will Power. The Law of Cause and Effect, the Law of Awareness, the Law of Free Will and the Law of Correspondence, the Law of Creation, the Law of Love, and many many more. Take your life into your own hands be the Master of Your Life - Understand your Creator and understand Life and create Your Own Miracles! The Law of Gratitude wonderfully presented here- a must watch! Here's another new Universal Law! Cognition as an observer of Reality. This means that when you look at things, things change. You can change reality by observing reality. Your perception is not reality! Watch this video and understand the impact of what it means for you and your reality of life.